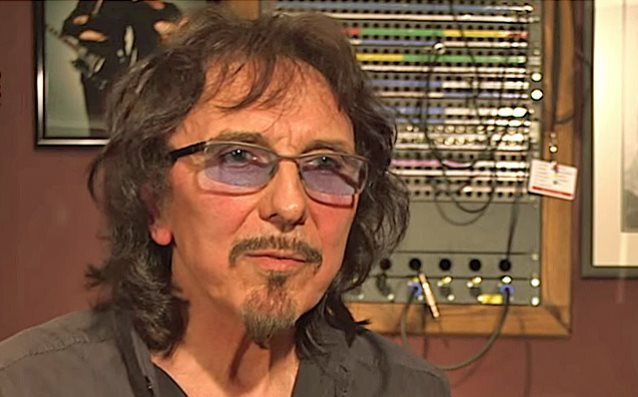 For the fourth heat of Sky Arts' new series "Guitar Star", the hopeful rock guitarists will be mentored by legendary BLACK SABBATH axeman Tony Iommi. U.K.'s Total Guitar magazine spoke to Tony ahead of filming about his first experiences recording in a studio. He also talked about one of his oldest Jaydee Custom SG guitars, handmade by John Diggins. You can watch the footage of Tony mentoring the four contestants in the rock episode of "Guitar Star" on Tuesday, July 14 at 8 p.m. on Sky Arts. Sky's official description of "Guitar Star": "Pick up a plectrum and crank the volume up to eleven — we've launched 'Guitar Star', a major new competition to search for a world-class guitarist. "We're searching the U.K. and Ireland for extraordinary guitar players who are willing to jam, strum and pluck their way to victory for the chance to perform on the main stage of major U.K. music festival, Latitude. "Whether their jam is rock, classical, jazz or acoustic, competing guitarists will be tested on their ability to play in a style of their choice and demonstrate outstanding skill and ability, and will perform at famous venues associated with their chosen genre. "Throughout the process, they'll meet and be mentored by some of the biggest guitar stars in the world. The semi-finalists will hone their act in a recording studio, where they will work with a global guitar legend to perfect their sound. "All of this will be taking place under the watchful eye of top DJ Edith Bowman, who added 'The guitar is the most loved and most played instrument in the U.K. and I just know there are some fantastic unknown players out there... I can't wait to get stuck in to celebrating the wonders of the guitar across rock, jazz, folk, classical and beyond!'"